Pump Up the Volume With Hi-Tech Audio. 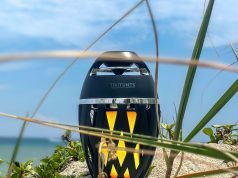 Music is a huge part of boating and fun on the water, and today’s latest electronics make it easier than ever to enjoy tunes on your boat. Whether you’re into rock or Bach, hip-hop or Handel, there are ways to trick out your vessel with receivers, speakers and amplifiers that greatly improve sound quality and the functionality of the system. 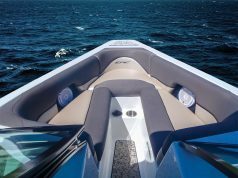 Most boats have some type of audio/entertainment system already in place, and the question becomes whether you need to replace or simply enhance what you already have. If your current stereo receiver is pre-Bluetooth or doesn’t have an AUX input or USB connection, then it makes a lot of sense to upgrade to a new stereo receiver head unit. Why? Because most of today’s entry-level stereo receivers can still play AM/FM radio while offering Bluetooth/USB/AUX capability. That’s a huge benefit because now the music on your smartphone or iPad can be easily routed through the receiver and played on board. 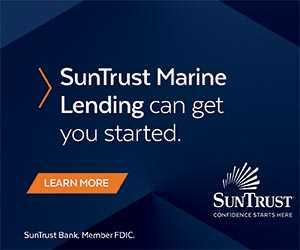 Having those three connection options from your smartphone to the receiver—Bluetooth/USB/AUX—removes a lot of the headaches of getting the music off your phone so it can play through your boat’s speakers. While a USB connection is a great way to go because you can charge your phone while it delivers the music to the receiver, there are cases where the receiver does not support an Apple or Android product. So if you can connect to the receiver via Bluetooth or the 3.5mm AUX input—the headphone jack on your phone—you can get around any compatibility issues. One affordable option for upgrading your receiver is Prospec Electronics Milennia PRV21, which offers AM/FM radio and Bluetooth/USB/AUX—all for $179.95. The compact device measures 6″ x 4″ x 2½”; the receiver has a waterproof faceplate and is UV resistant. A green backlit LCD screen makes viewing what’s playing on the receiver easy. 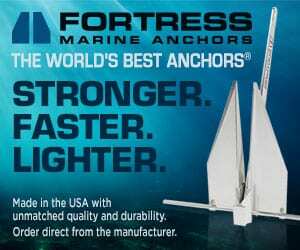 For larger boats, the big push is for integration and control of individual vessel components onto a multifunction display. FUSION Entertainment’s new FUSION-Link™ is now available on multifunction displays from B&G, Furuno, Garmin, Humminbird, Lowrance, Murphy Instruments, Raymarine, and Simrad. This allows for easy control of the entertainment system using the split screens on your MFD. 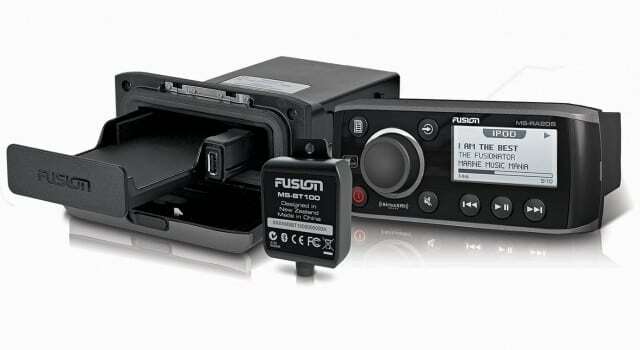 FUSION’s True-Marine™ product line includes stereos with iPod/iPhone and DVD/CD system integration. 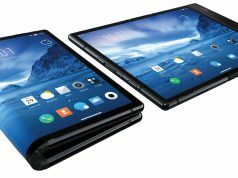 FUSION-Link™ technology provides access, control and communication with multifunction displays, remotes and popular smartphones or tablets running the company’s app. For smaller boats with limited space on the dash, there’s the FUSION Ultimate Stereo Pack, a new bundled marine stereo package. It features the ultra-compact FUSION MS-RA205 stereo, the MS-UNIDOCK Universal Media Device Dock, Bluetooth, and a DIN sized mounting plate. It retails for $399. The MS-RA205 delivers AM/FM radio, is SiriusXM ready, receives marine VHF and features multi-zone control that allows for the adjustment of volume, balance and subwoofer in areas throughout the boat independently or in relation to one another. The system’s UNI-Dock supports a wide array of smartphones, media players and USB devices, including Apple products, while keeping them powered and safe from saltwater. Now, if you want to stay old school and just use your existing stereo receiver that delivers AM/FM radio to speakers on the boat, you can add an amplifier or upgrade your speakers easily. Aquatic AV’s digital 2-channel Shockwave Technology marine amplifier is rugged and waterproof, and helps boost sound in both 4-ohm and 2-ohm speaker configurations. It is specially designed with low-noise circuitry to produce high-quality, true sound reproduction from any source and retails for $399. For a speaker upgrade, Prospec offers eight Milennia speaker models with a range of sizes and colors. The Milennia MILSPK352BG speaker delivers powerful sound in a small size. Built for use in wet conditions, it’s a complementary speaker to a larger system or can stand on its own. It measures 37/8″, while the cutout is 3¼”. Finally, Sonos is a wireless audio system that allows you to stream music directly from your iPhone or smartphone. With Sonos there isn’t a receiver—you control and stream your music wirelessly from the Sonos app on your phone to Sonos speakers placed throughout the boat. The speakers have to be wired for 110-volt power and there are many configuration options.